Thierry Henry will join the Belgium national team’s coaching staff as Roberto Martinez’s assistant. 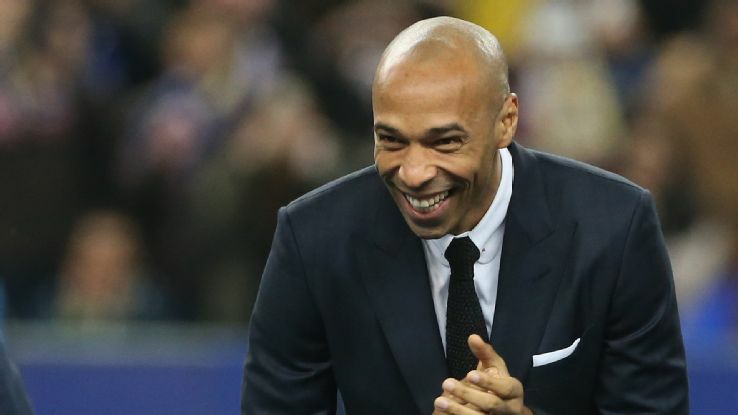 Former France international Henry had been working as coach of Arsenal’s under-18 side before leaving last month after Arsene Wenger told him he could not continue in the role unless he quit his work as a TV pundit. He will now take on a role with Belgium, who are second in the FIFA World Ranking but failed to live up to expectations under Marc Wilmots at Euro 2016, where they were beaten 3-1 by Wales in the quarterfinals. Henry won the 1998 World Cup and Euro 2000, and Martinez, who wasappointed earlier this month, feels that his experience can help improve the mentality of the current generation of Belgian players. “He’s someone that has been in the situation of having to develop a mentality as a team to chase the dream of winning something special,” the Spaniard said. Martinez will also be joined by Graeme Jones, his former assistant manager at Swansea, Wigan and Everton, and said: “The contact time that we have with the players during the season is very short so the impact has to be as big as we can. Martinez said Henry had been “very keen” to join the staff and that he had turned to the former Arsenal striker in part because he believes he can help get the best out of Belgium’s forwards. “The attacking quality that we have got in our group is very rich,” Martinez said. Martinez has given Burnley midfielder Steven Defour, Everton attacker Kevin Mirallas and Newcastle goalkeeper Matz Sels a chance to impress ahead of his first match in charge against Spain in Brussels on Sept. 1 and a World Cup qualifier in Cyprus on Sept. 6. Mirallas had a difficult last season under Martinez at Everton but the new Belgium boss said there was no lingering issue with the forward. “I don’t think it’s anything to forget,” Martinez said. “As a player you always want to play and that should be the case. You shouldn’t have a player that is happy with not playing. “The other thing is that unfortunately you have to be at your best level in order to play. And that happens in every dressing room. Martinez watched Defour, 28, make a winning start on his Burnley debut against Liverpool last weekend and he felt the ex-Anderlecht player deserved a first call-up since November 2015. “I think we could speak about the physical element, the technical element, the tactical element of any player,” he said. “I’m very, very interested in the mentality of the group that we’re going to put together. “For me Steven Defour, I saw him in his debut with Burnley… in a very difficult game. And I was very impressed with his mentality. Martinez said that, without having met the players, it would be too early to select his captain in the absence of injured Manchester City defender Vincent Kompany.